(Preface): The Carolinas Campaign began on February 1, 1865, when Union Gen. William T. Sherman led his army north from Savannah, Georgia, after the “March to the Sea.” Sherman's objective was to join Gen. Ulysses S. Grant in Virginia to crush Gen. Robert E. Lee's Army of Northern Virginia. Scattered Confederate forces consolidated in North Carolina, the Confederacy's logistical lifeline, where Sherman defeated Gen. Joseph E. Johnston's last-ditch attack at Bentonville. After Sherman was reinforced at Goldsboro late in March, Johnston saw the futility of further resistance and surrendered on April 26, essentially ending the Civil War. * * *Hoping to deflect Union Gen. William T. Sherman's army from Goldsboro, Confederate Gen. Joseph E. Johnston attacked Sherman's Left Wing here on March 19, 1865, after finding it separated from the Right Wing, located several miles southeast. As the fighting intensified, Sherman led the Right Wing here in support. Johnston's forces, vastly outnumbered, withdrew to Smithfield on March 21, and Sherman's army marched to Goldsboro. This map from the marker shows the Union approach from Goldsboro to Smithfield. shell were thick on shrub and tree. At a certain height from the surface, there was scarcely a twig or bough that did not present a transverse groove, or its abrupt termination.” - Surgeon James Mowris, 117th New York Infantry, describing the landscape around Bentonville after the battle. This is the road on which elements of Union Gen. Alfred H. Terry’s X Corps marched from Goldsboro to Smithfield. Gen. William T. Sherman’s army left Goldsboro on April 10, 1865, in high spirits, having rested and been issued new uniforms and rations. Divided into Left and Right Wings, the army completed the march to Smithfield in two days, and Terry’s corps passed through Bentonville and bivouacked a few miles beyond the village on April 11. The soldiers observed that the village was destitute and many houses still sheltered wounded Confederates. Terry’s men rebuilt Mill Creek Bridge, which had been destroyed on March 22, by mid-afternoon on April 11. At this time, Sherman commanded 88,948 officers and men, outnumbering Confederate Gen. Joseph E. Johnston’s army almost four to one. As the Union army approached Smithfield, light skirmishing broke out near Moccasin Creek, and the advancing Federals destroyed several homes and businesses along the line of march. Gen. William T. Sherman, regarding the advance to Smithfield. Location. 35° 28.115′ N, 78° 23.084′ W. Marker is in Smithfield, North Carolina, in Johnston County. Marker is on U.S. 301, on the right when traveling north. Touch for map. 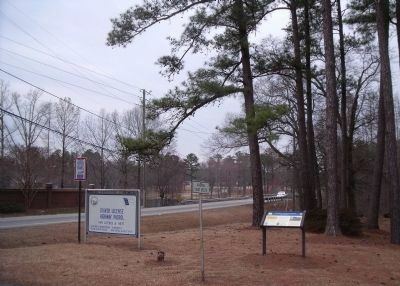 Marker is located on US-301, near the office of NC Highway Patrol Troop C, District VI. Marker is in this post office area: Smithfield NC 27577, United States of America. Touch for directions. Other nearby markers. At least 8 other markers are within 5 miles of this marker, measured as the crow flies. 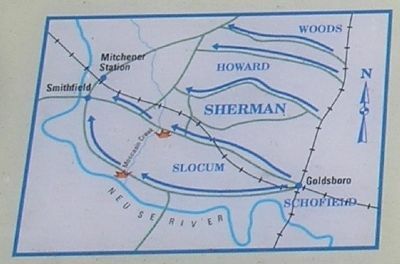 Sherman’s March (approx. 2.9 miles away); Hastings House (approx. 3.6 miles away); Town of Smithfield (approx. 3.6 miles away); a different marker also named The Town of Smithfield (approx. 3.6 miles away); Edward W. Pou (approx. 3.6 miles away); Sherman Receives News of Lee's Surrender in Smithfield (approx. 3.6 miles away); Occupation of Smithfield (approx. 3.6 miles away); Confederate Line of March (approx. 4.2 miles away). Touch for a list and map of all markers in Smithfield. More about this marker. The upper right of the marker contains an illustration from Harper’s Weekly of “Sherman’s destruction on the Southern landscape.” The bottom of the marker features photographs of Generals Alfred H. Terry and William T. Sherman, courtesy of the Library of Congress. Also present is a map of Union troop movements from Goldsboro to Smithfield. More. 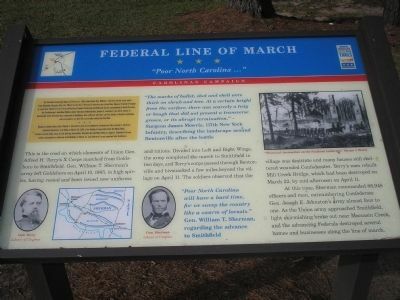 Search the internet for Federal Line of March. Credits. This page was last revised on June 16, 2016. This page originally submitted on December 26, 2008, by Bill Coughlin of North Arlington, New Jersey. This page has been viewed 1,949 times since then and 10 times this year. Photos: 1, 2. submitted on December 26, 2008, by Bill Coughlin of North Arlington, New Jersey. 3. submitted on March 12, 2010, by Bernard Fisher of Mechanicsville, Virginia.